Lake Arrowhead Park (the site of the Luray Triathlon) is a 134-acre recreation area located 4 miles outside the Luray town limits. Built in the early 1970’s, the park has a 34-acre lake with fishing, boating, and a white sand beach for swimming. Two miles of hiking trails take visitors through wooded areas with one trail that circles the entire lake. Six picnic shelters, playground areas for kids and handicapped accessible restrooms with showers help make Lake Arrowhead an ideal place for visitors of all ages! The main parking entrance will be closed when the race starts for athletes entering and exiting the park for both the bike and run portions of the race. For safety reasons during the race, we ask that spectators please enjoy watching the athletes from within the park. 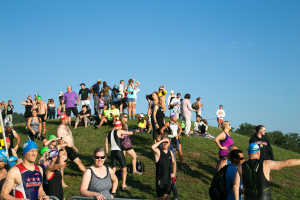 You’ll be able to watch the swim either lakeside or up on one of the embankments. The athletes will run out of the lake and up the stairs to pass through transition. They will return to the transition area after the bike to head out again on the run before finally finishing in the park. If you need to leave early, we’ll direct you out the back gate. Note that you will turn left onto Lake Arrowhead Road upon leaving the park then follow the signs back to Highway 211 and downtown Luray.